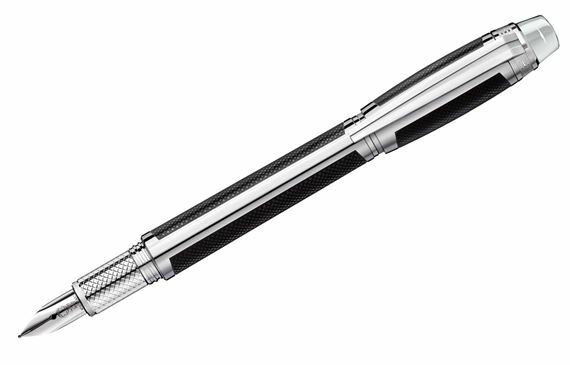 Order your Montblanc StarWalker Spirit of Racing Metal Fountain Pen today from FahrneysPens.com. Fine Pens, Refills & Luxurious Gifts – great prices & fast shipping. The Spirit of Racing collection brings a sporty edge to the StarWalker collection, synonymous with innovation, performance and forward momentum. The collection consists of a Doué model with platinum-finish cap and black resin barrel, and a special edition Metal version in high-grade stainless steel with anthracite inlays. The black resin parts on both models feature a pattern inspired by the tread of racing tires for a new look and feel. The knurled front section evokes the pattern used in racing cars to offer a better grip. 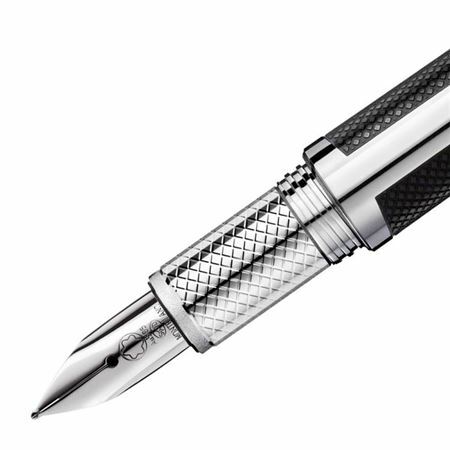 Both Spirit of Racing models are available in a fountain pen with rhodium-finish 14K gold nib and a fineliner. The Metal fountain pen only comes in a medium size nib. Cartridge fill only.